As I mentioned before, Lonely Planet, the world famous travel magazine, picked the Negev as the second most desirable world region to visit for 2013, not only for its sheer beauty, but also for the variety of interesting places, fascinating history, diverse people and the many adventures and quiet meditative moments one can experience here. And now, after we’ve peeked into the awe inspiring Small Makhtesh, toured Mamsheet‘s ancient streets and Nabatean Market, collected colorful sands in the Large Makhtesh, we come to the ‘Jewel in the Crown’ of the beautiful Negev Desert, Makhtesh Ramon. 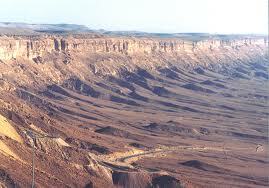 First and foremost, Makhtesh Ramon is the Grand Canyon of Israel. Created by erosion of sandstone and limestone layers over millions of years, this makhtesh is the largest such geological formation in Israel, stretching about 40 km from end to end and 2-10 km wide. The makhtesh has been a thriving habitat for many species of animals and plants and a crossroads for nomadic people for millennia. For tourism, activities and accommodation purposes, the town overlooking the makhtesh is Mitzpe Ramon, a small community with a lot to offer. Hike in the gorgeous desert with your family? 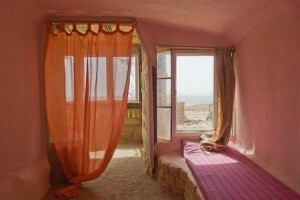 Sleep in a Bedouin tent and enjoy Bedouin hospitality? Ride a camel along the ancient Nabatean Incense Route? Take a jeep tour through millions of years of the geological timeline? Learn how Israel leads the world in anti-desertification techniques? Study the stars in the pitch black night of the desert? Taste the delicious produce grown here and exported to the world? 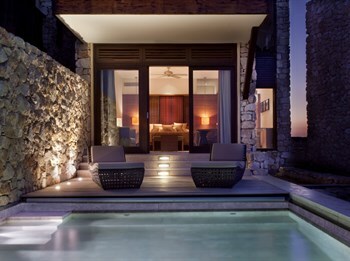 Stay at a 5-Star hotel with the most amazing view from your personal, outdoor pool? Get cozy with alpacas (?!?) who happen to thrive in the desert climate? Go wine tasting at award winning boutique wineries? Learn about David Ben Gurion’s dream, visit his home and his graveside? Rest and relax in one of the many B&Bs in the area? 1. (hiking, archaeology) Khan Saharonim– In the heart of Makhtesh Ramon lay the ruins of one of the Nabatean caravansaries (khan) on the ancient Incense Route from Yemen to Gaza. The Nabateans were THE expert desert travelers 2000 years ago, building an empire based on the trade of incense, spices and perfumes, and here they rested their camels and their weary bodies on their months long journey. (fossils, hiking) Ammonite Wall – Ammonites were large mollusks that lived in the ancient seas and became extinct 65 million years ago. They moved around by filling their shells with air and then releasing it. When the Ammonites died, they floated and were carried toward shallower waters close to shore. Thus, great numbers of Ammonite shells collected in one place. One of these Ammonite graveyards can be seen right outside Makhtesh Ramon. 3. 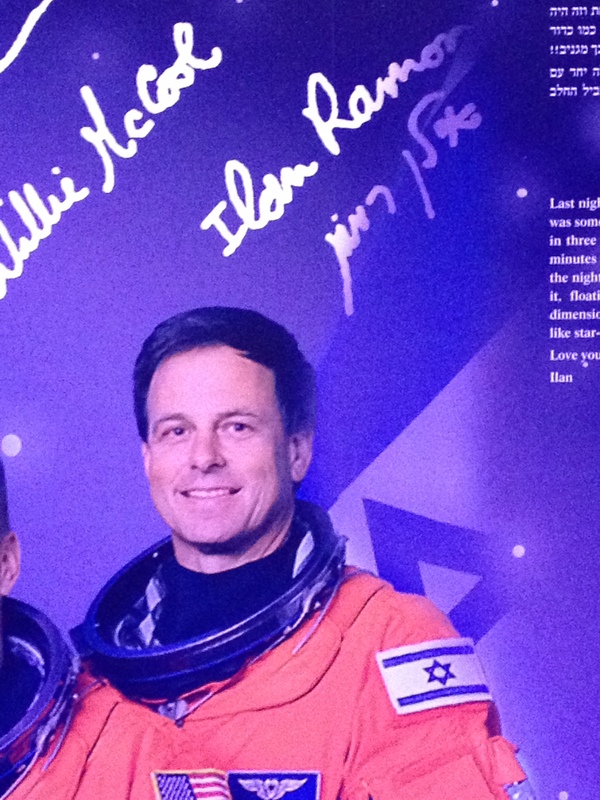 (modern Israeli history, museum) Ilan Ramon Center – Ilan Ramon, Israel’s first astronaut, loved the Makhtesh Ramon area so much, that as a young pilot, he changed his family name to Ramon, in honor of this spectacular geological formation. He was one of Israel’s heroes but his life was tragically cut short when he perished with the crew of the Columbia Space Shuttle in 2003. A museum honoring his legacy was just opened, overlooking the spectacular makhtesh . Definitely worth the visit. 4. (luxury, location location location) The Beresheet Hotel – Situated on the edge of the towering cliffs of the makhtesh and blessed with a breathtaking view, this exceptional hotel is pure luxury. 5. 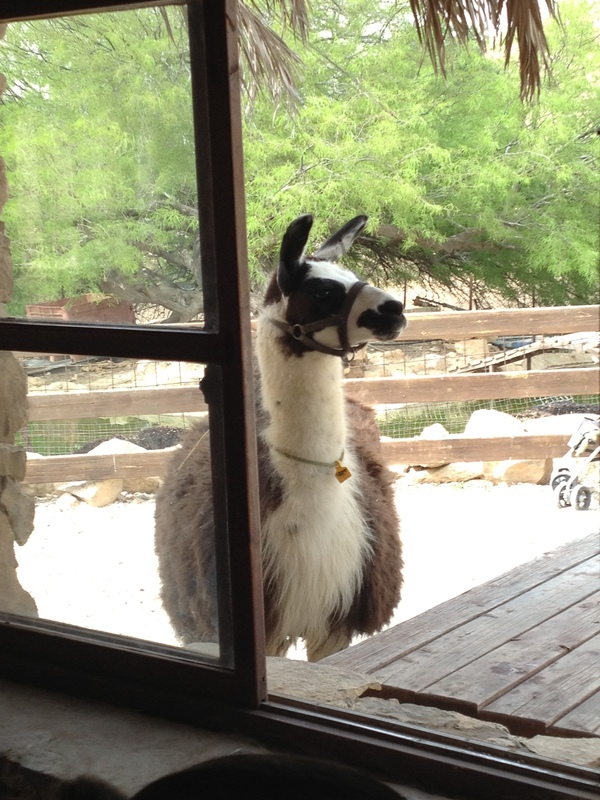 (entrepreneurship, animals, family fun) The Alpaca Farm – One of the strangest experiences one encounters near Mitzpeh Ramon is at this farm, where one can get up close and personal with a herd of alpacas and llamas … yes, you heard it right. Straight from the Andes Mountains, these camel relatives are thriving in the Negev Highlands, where the air is cold and crisp at night and the altitude is just right. Sheep, horses and other critters make for a fun day for the whole family. 6. (astronomy) Star gazing, anyone? 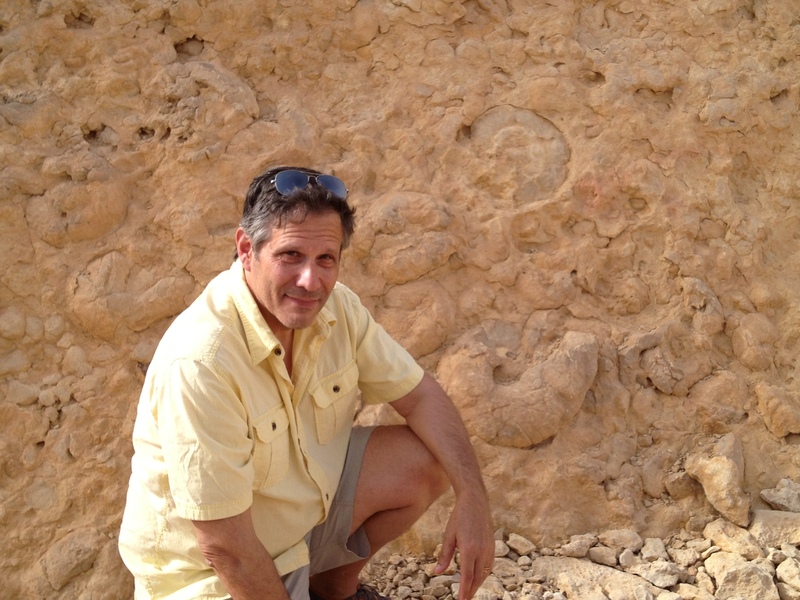 – My friend Ira Machevsky leads guided, customized tours of the starry desert night, the clearest sky in the country. No astronomy experience is necessary… just bring a warm jacket and enjoy! 7. 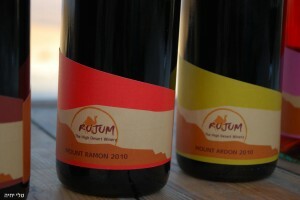 (entrepreneurship, wine tasting, food) Rujum Winery – When the Nabateans converted to Christianity in the 3rd century CE, they turned their agricultural efforts to the growing of vineyards in the desert in order to supply wine during the Byzantine Era. The high desert plain actually produces excellent grapes due to the loose soil, bright sunshine and extreme temperature differences between night and day and the seasons of the year. 9. (culture, Bedouins, food) Bedouin Encounters – If you are interested in the REAL thing, an authentic encounter with Israeli Bedouins, this is the place. Stay at a Bedouin village, sleep communally in a Bedouin tent, enjoy a delicious dinner prepared in front of you, ride camels, chat with Sheikh Salman, leader of this Bedouin clan. Spartan conditions, unforgettable experience! And we haven’t even made a dent in the myriad activities and experiences to be had in the central Negev, let alone in the Arava Valley to the west or the magnificent Eilat Mountains and beaches to the south. Lonely Planet is right. The Negev is THE destination of choice for the travel aficionado! This entry was posted in adventures in Israel, archaeology, Bible, Christianity, hiking in Israel, history, Holy Land, Islam, Israel, Jewish history, Judaism, Negev, touring Israel, travel in Israel and tagged alpaca farm, ammonite wall, aricha, astronomy in israel, bedouin hospitality, bedouin tent, bedouins, ben gurion, beresheet hotel, biking in israel, camping in the negev, eco-lodge, eco-tourism, entrepreneurship in israel, fun activities for kids, hiking in Israel, ilan ramon, ilan ramon center, Incense route, ira machefsky, khan saharonim, kosher wine, Lonely Planet, makhtesh ramon, mitzpe ramon, nabateans, negev, negev highlands, rujum winery, spice route, star gazing, wine tasting. Bookmark the permalink.